This is the first global map of the giant asteroid Vesta composed from images recorded by the framing camera aboard NASA's Dawn spacecraft. 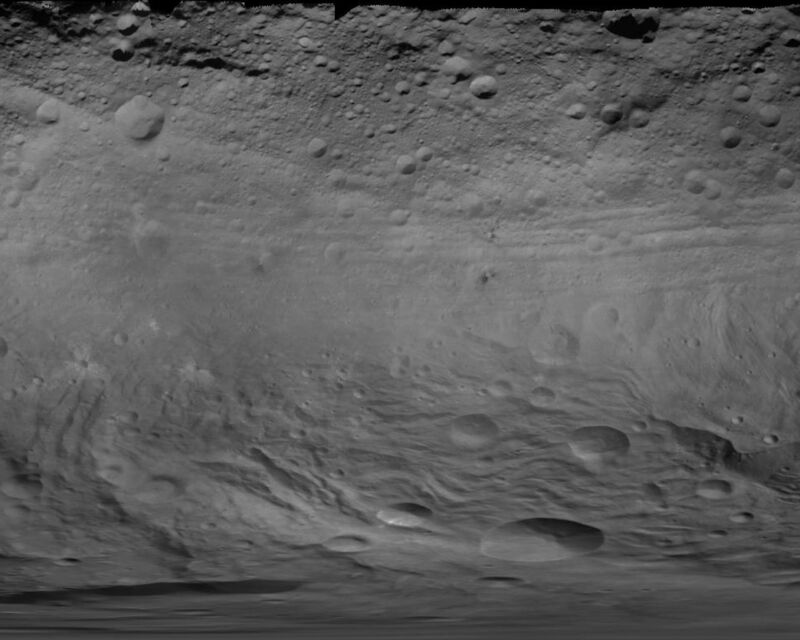 Dawn has been orbiting the second most massive object in the asteroid belt in a survey orbit, at approximately 1,700 miles (2,700 kilometers) above the surface, the entire month of August. The individual images were taken by the framing camera's clear filter at a resolution of about 260 meters per pixel. The equator is running parallel to the upper image border, approximately above the bright, smooth band of troughs. 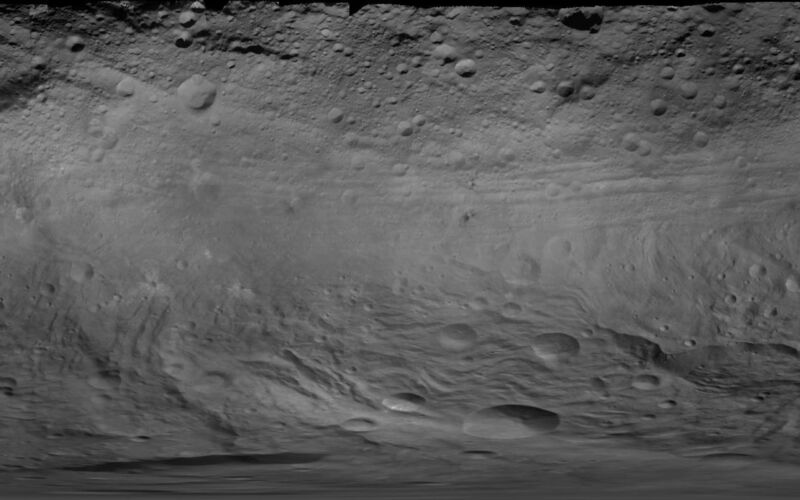 Towards the north pole (top of image), shadowed landscapes indicate that Vesta's northern latitude is in seasonal shadow due to the north-polar "winter" night. 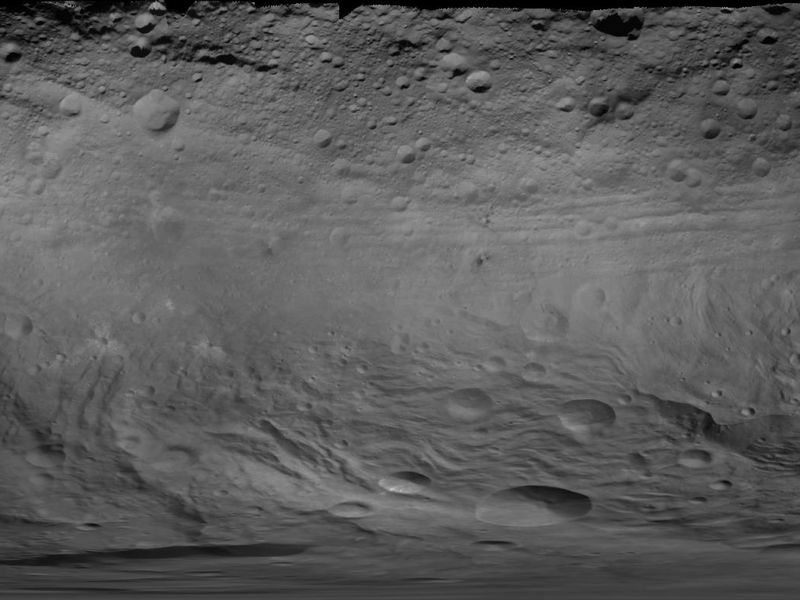 Vesta is an irregular shaped body with its semi-major axes measuring about 180 miles, 174 miles and 142 miles (289 kilometers, 280 kilometers and 229 kilometers). The map is displayed in a geometry called "simple cylindrical projection." In such a projection, the south pole point is stretched to a line the same length as the equator, forming the lower limit of the image, where features in high southern latitudes appear distorted. The image resolution of the global map is approximately 750 meters per pixel. The Dawn mission to Vesta and Ceres is managed by NASA's Jet Propulsion Laboratory, a division of the California Institute of Technology in Pasadena, for NASA's Science Mission Directorate, Washington. UCLA is responsible for overall Dawn mission science. The Dawn framing cameras were developed and built under the leadership of the Max Planck Institute for Solar System Research, Katlenburg-Lindau, Germany, with significant contributions by DLR German Aerospace Center, Institute of Planetary Research, Berlin, and in coordination with the Institute of Computer and Communication Network Engineering, Braunschweig. The Framing Camera project is funded by the Max Planck Society, DLR, and NASA/JPL.